Reins made of rubber and leather with hand stops for a secure grip. Great for shows. Michel Robert and numerous international jumpers have been using these reins for years. The rider can keep securely the same length of reins thanks to the hand stops that are placed every 10 cm. The reins are made of a material that offers a better grip than the traditional rubber. 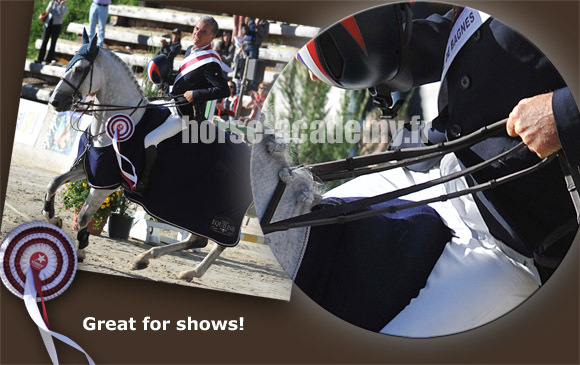 This feature is well appreciated when in competition or on a rainy weather where traditional reins would be slippery. The material offers the advantage of being very flexible, wear-free and care-free.In addition, the loop of the reins can be shortened by adjusting the buckle end.